Rediff.com » Business » Wanna visit Lord's with a cricketing great? Or Paris with an Indian chef? Wanna visit Lord's with a cricketing great? Or Paris with an Indian chef? Travel portal Yatra is planning to come up with a luxury travel vertical, where celebrities such as sports persons, actors, famous chefs or social media influencers will act as guides to travellers. If you like to travel in 7-star style and yearn for that extra bit of star value, this could be just up your street. 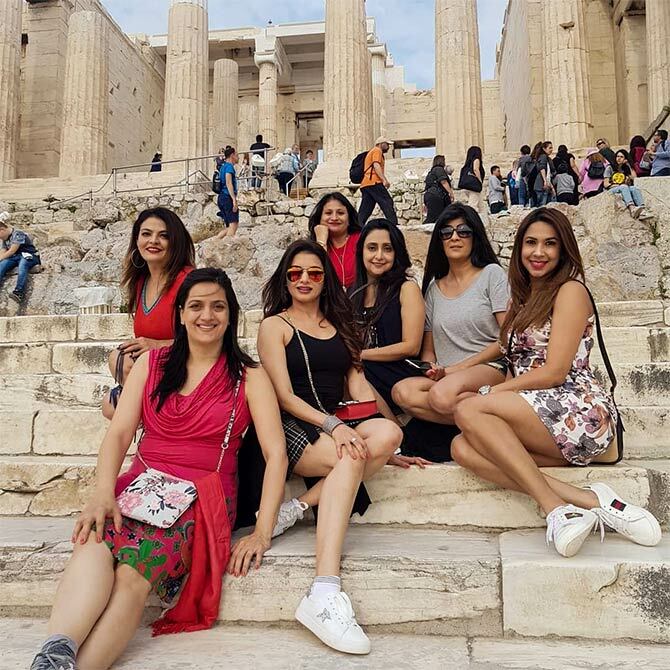 Image: Actress Bhagyashree at the Acropolis, Athens. Picture used only for representational purpose. Photograph: Courtesy Bhagyashree/Instagram. Picture this. You are sitting in the Lord’s Cricket Ground, watching a match with your favourite ex-cricketer, who later takes you for an evening out with a few of the players and then a walk around London to all his favourite pubs. Or you are travelling through Tuscany in Italy with a celebrity chef who guides you to the restaurants and trattorias he likes to frequent, so you wine and dine on the best that the region has to offer. If you have the moolah you could turn that wish into reality. Travel portal Yatra is planning to come up with a luxury travel vertical, where celebrities such as sports persons, actors, famous chefs or social media influencers will act as guides to travellers. If you like to travel in 7-star style and yearn for that extra bit of star value, this could be just up your street. Yatra, India’s second-largest travel portal, wants to tap into India’s 160,000-strong high net worth individual base for this ultra-luxury, bespoke travel option. The company has been in talks with a host of celebrities and is now in the process of finalising contracts to have them on board as ‘theme-based guides’. While the names of the celebrities on offer have been kept under wraps, sources said well-known golfers, tennis players, cricketers, actors, television chefs, and even reality show participants had been approached. “The idea is to provide theme-based travel options where celebrities take guests to their favourite spots in a particular holiday destination and give them an inside look into those places. For example, a well-known tennis player could take the guests to the US Open, tell them some lesser known facts about the place, help them meet other players and then dine with them at his favourite restaurant,” said a source close to the company. Yatra, which is planning to roll out the exclusive service around Dussehra this year, hopes to mobilise a niche segment where the number of bookings might be less, but the ticket size would be huge. With a price tag of anywhere between Rs 500,000 and Rs 1.5 million, these packages are aimed at India’s HNIs or millennials with fat pay packages. According to recent reports, by 2022, the number of HNIs -- which currently stands at 160,000 -- could go up to almost 330,000, with a combined net worth of over Rs 355 billion. The company believes that it would have the first-mover advantage as none of its competitors in the digital travel space has got similar offerings. “Small travel operators do provide bespoke solutions to HNIs planning vacations. But Yatra plans to do this at scale and believes that this could be a major revenue generator in the future,” said the source. According to industry analysts, with an annualised growth rate of 6 per cent, India’s luxury travel segment could be worth around $1 trillion in the next five years. “Most of the online travel is aimed at the millennial business-to-consumer customer and not providing niche products for those looking beyond deals. When the celebrity-guided holiday packages are launched, it would be the first foray by a large company into luxury at scale,” the source said. Before it begins to make the pitch to customers, the company is figuring out the luxury supply chain and finalising the holiday packages. It has had several rounds of talks with various palace hotels, luxury safari tours, exclusive resort islands, and tourism boards throughout the world to draw up packages curated especially for HNI clients.